Maybe Jordan Morgan was onto something. On the eve of the Michigan basketball team's NCAA Tournament opener against Ohio last month, I asked the 6-foot-8 forward if there was a growing sentiment to continue the season as far as possible for departing seniors Zack Novak and Stu Douglass. Morgan, as bluntly as possible, said no. It was about much, much more than that. "You never know how long this group of players is going to be together," said Morgan as his eyes pointed toward his underclassmen teammates inside their Bridgestone Arena locker room. "This could be our last game where we're all playing together." A little more than 24 hours later, Michigan’s season ended. Five days later, Morgan’s unintentional prophecy came true when the school announced Evan Smotrycz, Carlton Brundidge and Colton Christian would transfer. John Beilein has rebuilt the Michigan basketball program to the point where it's only normal to have attrition, whether it's elite-level talent moving to the NBA or other players looking for more playing time elsewhere. And now, less than a month after ending the most successful regular season in the program’s last 26 years, the team’s future looks even more clouded as Trey Burke continues to weigh his NBA draft options. Welcome back to major college basketball, Michigan. This is the part they don’t tell you about in the brochure. Having excitement about the future is nice, but on this stage -- when you recruit and sign elite-level talent -- living in the now is about all one can really do. If Burke opts to leave school after one season, it’d mark the third straight year the Wolverines lost an early-entry guard to the NBA draft. Ideal? No. A necessary evil? Yes, actually. Teams need talent to win, and talent isn’t everlasting. It has options. It gets ideas. It has dreams that often swell beyond the walls of a college locker room. And if you want to play with the big boys, run with the best and compete for titles, sometimes you have to roll with the punches and adapt accordingly. Michigan didn’t expect Darius Morris to leave prior to the conclusion of the 2010-11 season, but he did. And the Wolverines moved on. Michigan didn’t expect Burke to leave prior to the conclusion of the 2011-12 season, but he might. If he does, it’ll have to move on. Whether Burke stays or goes, John Beilein’s program will be in this position again down the road -- and that’s not always a bad thing. Some have questioned Burke’s decision to look into the NBA at all, and called any desire to leave a poor choice. That is foolish. He’s a talented basketball player with a dream, which he’s very much allowed to pursue. A poor choice would have been to blindly ignore the situation and not take an educated look at the NBA landscape. Well, that’s not just a peril of playing on the big stage, it’s a roadblock at every level of the game. On March 28, six days before Kentucky beat Kansas to close out the 2011-12 season, CBS’ Jeff Goodman published a list of every player in America that had the intention of transferring. It contained 174 names. That's roughly 13 full teams. College basketball isn’t what it was 20 years ago. It’s not what it was 10 years ago. Players re-evaluate, they read mock drafts, they yearn for more playing time and they often have more voices in their ears than credit hours in a semester. 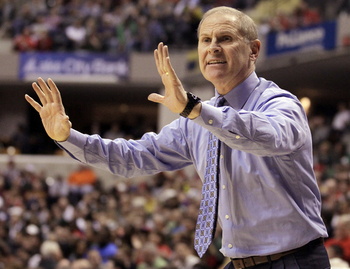 In five years, Beilein has successfully rebuilt the Michigan basketball program. The Wolverines expect to be an NCAA Tournament team each year, and recruit like it. When you play at that level, you put everything you have into today, because you can’t predict tomorrow. You recruit for the future, you plan for the future and you stock up for the future. But you still can’t predict it. To believe otherwise is naive, archaic and just plain dumb. Uncertainty is part of the deal now. Sat, Apr 7, 2012 : 1:25 a.m. Wait, no, it'd? Really, it'd? Now believe me, I know how to speak some slang, but this is not something that has ever come out of me even if I was trying to be cool. Sat, Apr 7, 2012 : 5:23 p.m. It is informal, but it'd is a perfectly acceptable contraction. Sat, Apr 7, 2012 : 1:16 a.m.
John Calipari, yes this is who Michigan should have hired. 3 years national champs. Beilien 5 years and can not get past a MAC school in the first round. I hope Brandon finds a great womens coach because Bill Martin sure whiffed when he passed on Suzy Merchant. No reason Michigan should not be on the level of Baylor, Conn, and Tenn when it comes to womens hoops. Perhaps this will be good practice for Brandon and the he can work on up grading our mens program! GO BLUE!!!! Fri, Apr 6, 2012 : 11:48 p.m. Losing 4 guys in two weeks, including two starters is not &quot;part of the deal these days&quot; It is a problem when role playing starters leave for no apparent reason, and guys consistently leave for the NBA when they are not even close to ready. On the bright side, coach B seems to make mediocre players look like great players, so they take their shot at the league while they have the chance. Fri, Apr 6, 2012 : 9:29 p.m. The NBA is enabling the one-and-done deal. I would like to see the NBA adopt the same rules that we see in Major League Baseball. High school players can be drafted. But if a player decides to go to college, then he cannot be drafted until he is either 21 or has completed his junior year. This one-and-done or two-and-done concept is a farce, and it is, you're right, changing college basketball. More accurately, tearing it apart. Fri, Apr 6, 2012 : 3:16 p.m.
Is there a reason to keep reporting this? When I saw the headline, I thought it meant he decided to leave. We all know he is looking into his NBA chances. Report something when it is news. Fri, Apr 6, 2012 : 3:05 p.m.
one thing you fail to mention in all this is the effect it has on the school's APR. Ask UConn how this natural attrition is working out for them. Also not noted in your reference to Calipari is his track record of charred remains at every campus he's coached at. The man is a walking NCAA violation. Sat, Apr 7, 2012 : 1:58 a.m. In all fairness, John Calpari probably had nothing to do with Marcus Camby taking money from an agent or Derrick Rose having someone else take his SAT for him. He just happened to be the coach of those players.